Please click on the + sign to the right of each question for details and answers. If you have any questions, which are not listed below, please do not hesitate to telephone us on 023 9238 0692 and we will be very happy to assist you. 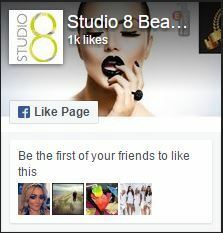 Studio 8 operate a loyalty rewards scheme “Pamper Me Reward Points”. The scheme is available for all Clients as a reward for their continued loyalty. In order to become a member of the Pamper me Reward Club or to remain in the club you must have visited the salon in the last 12 weeks with a minimum spend of £100. Each point has a nominal value of £1 and can be redeemed against services including special offers. For every £100 spent you will receive 5 points. Points are collected on the system automatically each visit and are allocated against the specific Client record card. A record of your points is available on your till receipt each time you visit including when they expire. Points cannot be redeemed against products or as a cash alternative and you must collect a minimum of 6 points before you are able to redeem. Points can only be redeemed against treatments that you have taken and they cannot be transferred or used by any other person and will automatically expire after 3 months. Points are managed automatically in the system and cannot be reinstated once they have expired. We reserve the right to remove membership of the scheme for Clients that do not adhere to our 24 hour cancellation policy including not attending their appointment. We reserve the right to withdraw the loyalty scheme or transfer to another loyalty scheme at any time. Our therapists work by an appointment and make every effort to ensure that appointments run to schedule. In order to assist please be prompt for your appointment. If you are a new Client to the salon or receiving a new treatment for the 1st time please arrive 5-10 minutes earlier in order to complete the required consultation form and ensure you receive your full treatment time. When you book an appointment with us you are asking us to reserve time exclusively for your use and in return, we agree not to offer this time to other clients. We understand that your plans may change at short notice or unforeseen circumstances can arise. If you are not able to attend your appointment, please contact us as soon as possible so we can offer the appointment to someone else and avoid charges to you. This includes if you are still able to attend but no longer require all the treatments that you had initially booked. If an appointment is cancelled less than 24 hours prior to your appointment there will be a charge of 30% of the treatment time booked. A cancellation giving less than 3 hours’ notice (including not taking all that you have booked at the time of appointment) there will be a 50% charge of the cancelled value. A no-show for most of us in this digital age is not acceptable (unless extenuating circumstances prevail) and will be charged in full. Certain treatments of 1.5 hours or more & specific treatments where set up of the room or reservation of equipment is required will require a deposit in order to reserve the therapists time. This is non-refundable if the appointment is cancelled 24 hours or less before the appointment time if we are unable to rebook the time. If you arrive late for your appointment and we are unable to fit you in or adapt your appointment during the remaining time you will be asked to reschedule. You will be charged for the late arrival appointment in full and you will need to pay for your rescheduled appointment as you are duplicating diary time and overheads. For group or larger bookings, a deposit of 50% is required at the time of booking and 7 days’ notice is required in order to cancel or you will lose your deposit. If, however we are able to fill some or all of the cancelled appointment space we will return the deposit depending on if the diary time that has been rebooked. For Wedding, Prom, Special Occasion, Hen and Pamper party bookings please refer to the specific booking form for our terms and conditions. When you pay a deposit, this will be placed on account and will be used as part payment at the time of attending your appointment. Subject to terms and conditions as described above this deposit is non-refundable if you fail to follow cancellation policy. In order to help you to remember your appointments we offer a reminder service. An automatic text or email reminder is sent 48 hours prior to your appointment. Please respond to this specific message and confirm your attendance by confirming YES or cancel by responding NO. If we do not receive a response, we will assume that you no longer require the appointment however we will make a courtesy call to check that you are still attending. Please note this will be 24 hours prior to the appointment time & you will be subject to our cancellation policy so if you do not show for your appointment you will be charged. By booking with Studio 8 you are accepting our terms and conditions. 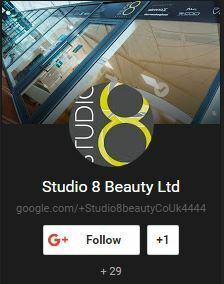 Where is Studio 8 Beauty Salon ? The salon is based on a prestigious business park known as 1000 Lakeside North Harbour (formerly IBM North Harbour site). The site is open to all visitors. Other facilities available include Starbucks, Hair OTT, Subway, and CoOp Florist, CoOp Convenience Store. In addition there is a Cafe in the main building serving hot meals, snacks and beverages. Where can I park when visiting the Salon ? There is plenty of free visitors parking around the retail area , overflow visitors parking and on the Lakeside North Harbour site including 3 dedicated parking spaces for Studio 8 Clients directly outside the salon. We politely ask that you do not park in spaces belonging to other companies. Please ignore the 2 hours limit as this is not relevant to visitors to the retail area. Do I require a Skin Patch test for some treatments ? We require a patch test for all eyebrow and eyelash tinting (tint sensitivity), lash perming (perm solution sensitivity) and eyelash extensions (glue sensitivity) 24 hours prior to treatment for 1st time Clients or those that have not had the treatment for 3 months or more. Certain skin treatments such as Biosurface Peel also require a patch test due to the bioactivity of the products used. This is to ensure Client safety. For insurance purposes unfortunately we are unable to accept any form of waiver. Can I bring children to the Salon ? As we offer an environment to relax and unwind, we politely request, that out of consideration for other clients, young children are not brought into the salon. For Health & Safety reasons we are not permitted to allow children into the treatment rooms. Can I leave my mobile on whilst at the Salon ? We do not insist that mobiles are switched off, however, in consideration of other clients we request that mobiles are switched to silent and that you do not take calls during your treatment or visit to the salon. Are Gift Cards or Gift Vouchers available for purchase ? Can I save if I buy a course of treatments ? We offer treatment courses for specific treatments with great savings. Please refer to our treatment menu for more details. What happens if I want to make a complaint ? Where we think your complaint is reasonable, we will redo a part or all of the service or treatment again as soon as possible, free of charge. The work will be done by a different beauty therapist if you prefer, although this may not be possible if the individual is self-employed. If, after following our complaints policy, we still can’t agree on how to resolve the complaint to your satisfaction, as required by the Alternative Dispute Resolution for Consumer Disputes Regulations 2015, we will refer you to a certified alternative dispute resolution provider, Hair & Beauty Mediation. As mediators, they listen to both sides and help us work towards a fair and reasonable compromise which is acceptable to both parties. It is not legally binding unless both parties agree on an outcome, but it is a cheaper and quicker alternative than taking legal action.